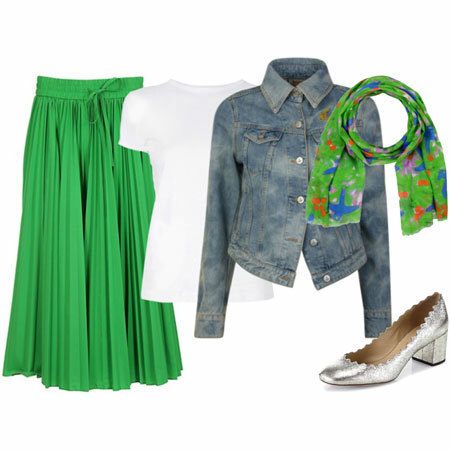 There’s nothing quite like a fun topper to give an outfit structure and personality. Here are six versatile jackets that take on a multitude of fashion personas. Bailey 44 ‘Racket’ Jacket: A playful form fitting jacket made of a stretchy knit for extra comfort. 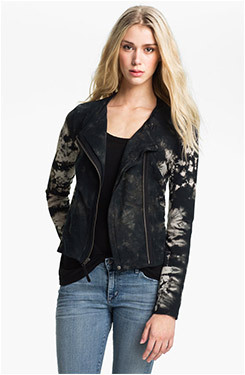 Ella Moss ‘Frankie’ Tie Dyed Moto Jacket: A tie-dye moto that mixes boho with tough girl, and a whole heap of comfort. Made of a soft jersey knit that is machine washable. MOD.lusive Lace Baseball Jacket: The quality isn’t as fab as the Truth & Pride coated lace bomber, but it’s a third of the price. It might just do the trick if you want to flirt with the trend without breaking the bank. 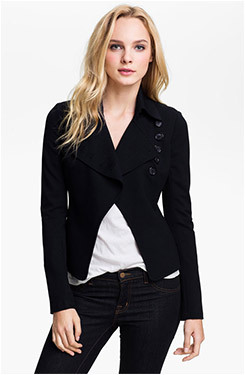 Kenneth Cole New York Tuxedo Jacket (Plus): Simple, crisp, classic fabness with a big dose of modern. 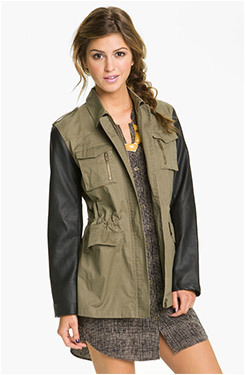 Blu Pepper Faux Leather Sleeve Utility Jacket (Juniors): The military and two toned topper trend in one jacket. Casual, boyish and rough around the edges. Jessica Simpson ‘Darryle’ Blazer: A relaxed le smoking in antique white with studded lapels. How very 2013. I rarely fasten the front of my jackets. I have a few that look best worn closed, but for the most part I prefer them worn open. I enjoy the vertical centre front line that is created down the front of the body when a jacket is worn open, as well as the roomier fit. How about you? This post contains links that earn commissions for YLF. Ooh. I love the Bailey 44 jacket, the utility jacket, and especially the studded smoking jacket. Like you, Angie, I rarely if ever fasten the front of my jackets. I like the looser fit and the layered look that results from keeping them open. Oh look at that lace bomber jacket. I missed that one during my searching of bombers, I’ll have to add that to the list to check out at Nordstrom. They are coming out with some fun blazers/jackets this season. probably should wear my jackets open. I think they would look better. I am not suer why I find myself buttoning them every time I wear them! I love the Citron tuxedo jacket, but that bright color would overwhelm me! Awesome finds. The lace jacket is now in my shopping basket Also loving the studded smoking jacket. Sweet. Thanks for all these great lists! Too funny Angie – I just posted last week that the tie dye moto was my latest Nordstrom love and I actually tried on that Jessica Simpson jacket which is carried by our local Bay store! I absolutely LOVED the Jessica Simpson blazer and it was 50% off and fit great but I wasn’t sure…should I go back and get it??? Let’s see…what’s calling to me from this grouping? The Bailey jacket and the smoking jacket! Love those! 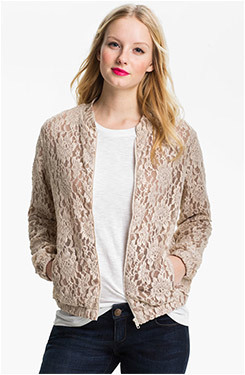 OMG, I love the lace jacket. I’m tempted by the cream color–although I really mostly wear black. Thanks for a great list. There is something for everyone! I bought the cream lace jacket. Angie I wait for this every week. This is a wonderful feature! I love the first two and the last one. I wish the smoking jacket were available in my size. My wardrobe couldn’t function without jackets and blazers, and I always feel at my best when my outfits include one. I too mostly wear them open. This is another fab selection, thanks Angie. The tuxedo jacket is calling to me in a serious way. 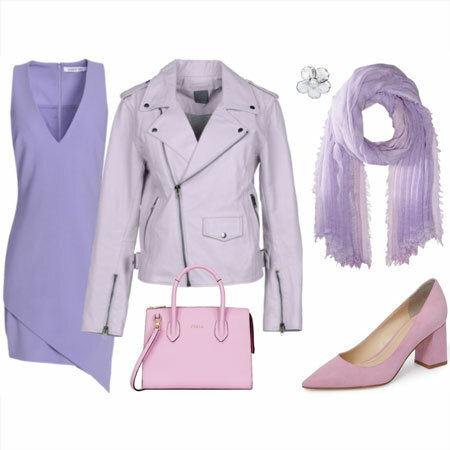 I love the color and think it would be a modern twist on the traditional blazer – and could see myself pairing it with a few pencil skirts or trousers for a day at the ofice. I have something very similar to the blu pepper jacket from american eagle. plan to debut it next week while on vacation in sunny florida!! Kimlee, that’s exactly right. The white tux jacket is a modern take on a blazer. I hope that the lace bomber works out, Debbie! The citron jacket is very fun! I don’t think it would particularly suit me, but I can see a lot of YLFers looking great in it! Why is it that even though I own a wonderful collection of jackets, new ones always call to me? Jackets are one thing it seems I can never get enough of! Janet – I’m exactly the same way. In my life, you can NEVER have too many jackets! Ooh. May have to stalk the citron and tie dye options! I love that lace jacket! I can’t wait to see how Debbie’s looks. To me buttoned or unbuttoned depends on the weather and how cold/warm I feel. Comfort 1st, style 2nd!